There is a big sage bush on the allotment right where we plan to put the greenhouse. We will try and transplant it but in case it doesn't make it I've dried out a lot sage and I also made this sage salt. I think it'll make a lovely gift and I may include it in my Christmas hampers later in the year. Plus, it's super easy to make. 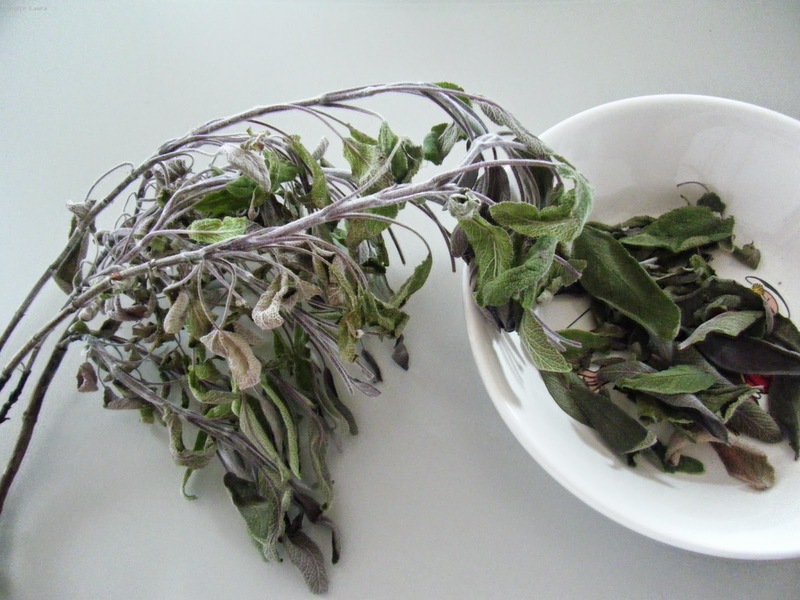 Leave the sage leaves in a cool dry place to dry out for a week. Pull the dried leaves off the stalks. Take a handful of dried sage leaves and mix them with rock salt. The amount of salt you use will depend on the vessel you intend to fill in this case I'm using 150g of rock salt. Put the salt into an airtight jar and the fragrant sage flavours will combine with salt. Leave it for at least a month to get a deep flavour then use your infused sage salt in cooking. Try sprinkling the sage salt on a chicken for lovely crispy skin.